Big investments are being made in green technology, which could spell hefty returns for the automobile industry and its backers as the first batch of the much-anticipated 2012 Fisker Karma rolls off the line. Electric vehicles, especially the plug-in hybrid like Fisker Automotive's Karma and General Motors' Chevrolet Volt, are gaining popularity amid high fuel prices. Ford Motor Company unveiled its Focus Electric earlier this year. The question is whether the niche market can grow long-term with the U.S. economy continuing to sputter and the high cost of purchasing the vehicles. For now, the automakers have reason to be pleased with the response to the technology. 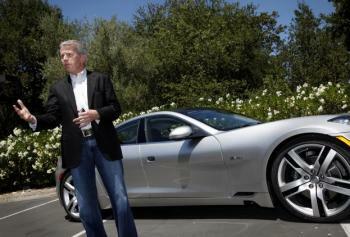 Some 3,000 people are already in line to buy one of Fisker's $100,000 luxury plug-in hybrids. The Karma is similar to the Volt, which switches to gas once the battery is depleted, a characteristic that, for some consumers, makes it a more palatable choice than the electric-only Nissan Leaf. In fact, the Karma's extended range is one reason Ray Lane, managing partner at investment firm Kleiner Perkins Caufield and Byers, wanted to back Fisker. Lane received his Karma last Tuesday. "He'd seen business plans for EV startups before, and most struck him as ‘neat ideas' that probably wouldn't work. Each required car buyers to make some kind of compromise, such as accepting limited range," writes David Baker for The San Francisco Chronicle. The firm has invested hundreds of millions of dollars into green tech over the past several years. According to GigaOM, Fisker represents one of between six and eight greentech companies that Kleiner thinks will deliver big returns for the firm. The Karma has a 22.6-kilowatt-hour lithium-ion battery pack that can power the car without gas for up to 50 miles. After that, its 2.0-liter direct-injected and turbocharged four-cylinder gas engine switches on to act as a range extender, generating electric power to feed the pair of 150-kilowatt electric motors that at drive the rear wheels, giving it a total range of about 300 miles. The four-passenger sedan has a top speed in excess of 125 mph and will accelerate from 0-to-60 in 5.9 seconds. Fisker Automotive says in real world driving the Karma can achieve the equivalent of 100 miles per gallon. Designed by Henrik Fisker, who was previously the design director for Aston Martin and president and CEO of BMW's Designworks USA, the Karma is assembled at Valmet Automotive in Finland and will be sold in North America through a network of premium brand retailers and globally through luxury importers. According to VentureBeat, Fisker Automotive is also working on a plug-in hybrid sedan called the N-1 that should retail for somewhere between $35,000 and $50,000. The Chevrolet Volt, also a plug-in hybrid, sells for $41,000. Fisker Automotive is an American car company founded in 2007.